Welcome to our new modern exposition “The Secrets of Tuskulenai Manor” established in the White Manor House. On February 2, 1998, the Government of the Republic of Lithuania formed the Commission for Immortalization of Memory of Tuskulėnai victims. At is proposal, by Resolution No. 932 of 19 June 2002 and Resolution No. 322 of 28 March 2007 of the Government of the Republic of Lithuania (the previous resolution was amended by supplementing it with new items), a programme for the creation of the Tuskulėnai Peace Park and its implementation measures were approved. A decision was taken to establish the Memorial Complex of the Tuskulėnai Peace Park (the Tuskulėnai Memorial or the Tuskulėnai Peace Park), its main objects being: the manor structures and the chapel-columbarium, where the victims of 1944–1947 NKVD–KGB repressions are buried. The territory of 4.9 ha in area was allocated to the Memorial. It sites the principal palace of the former Tuskulėnai Manor and officina, a manor park and its confines, where the chapel of St. Theresa and a small white manor (F. Walicki’s villa) have survived. 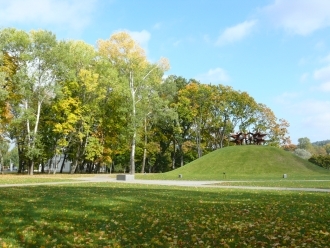 On December 31, 2008, the Ministry of Culture of the Republic of Lithuania passed over under the auspices of the Lithuanian Genocide and Resistance Research Centre (LGRRC) the Tuskulėnai Peace Park and all the buildings within its confines. 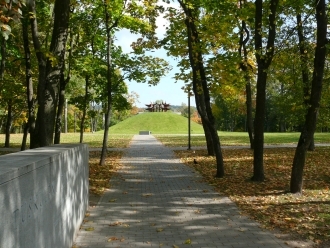 At present the Memorial Complex of the Tuskulėnai Peace Park is the subdivision of the Museum of Genocide Victims of the Memorial Department of this Centre. According to the museum and educational centre concept developed by a group of the LGRRC staff in 2004, an exposition “Project Homo Sovieticus” is planned to be arranged in the principal Tuskulėnai manor palace. The ground floor will house expositions dedicated to five themes, and the first floor will locate the educational-information centre. In the basement of the former white small manor, it is foreseen to stage an exposition “The Tuskulėnai Manor, Massacres in 1944-1947, Victims, Investigation” and to exhibit the 17th-century stove, detected by archeologists. The objective of expositions is not only to present the historical documents to the museum visitors, but also to make an emotional impact on them. With account of the needs of the contemporary society, especially youth, and the type of the accumulated material, opportunities will be created for visitors or their groups to familiarize with the virtual museum data. Video records, documents, photos and other iconographic material will be presented to the clients with the aid of computer, video and audio technology. In the Conference Hall of the Memorial Complex of the Tuskulėnai Peace Park, reviews of documentaries and feature films are held, exhibitions are displayed. Commemoration events, conferences and seminars are organized, education activity is carried out. 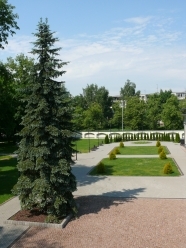 The Tuskulėnai Park is the place where in 1944 – 1947 the persons imprisoned and tortured in the KGB (NKGB – MGB) inner prison basements on which a death penalty was imposed were buried secretly. From September 28, 1944 to April 16, 1947, in the KGB (NKGB–MGB) inner prison, in Vilnius (Aukų Str. 2A), according to sentences of USSR military tribunals and special councils, death sentences were executed to 767 persons (another 7 died before the execution of a death sentence). The majority of them (613 people) were charged and sentenced under Article 58 of the RSFSR Criminal Code “High Treason”. Death penalties were executed by a special group formed of Department A of the KGB (NKGB–MGB) staff. After the executions, victim corpses were buried secretly in the mass graves of the former Tuskulėnai manor territory. 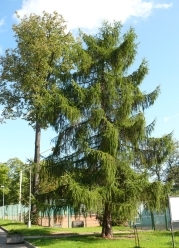 As a mass grave Tuskulėnai was used until the spring of 1947, when by Order of 26 May 1947 of the USSR Supreme Soviet, a death sentence was commuted to 25 years of imprisonment, suspending its execution until 1950. In the park territory in 1994 – 1996 and 2003, after carrying out archeological investigations, the remains of 724 people were found. The remains of seven people were passed over for burying to their relatives, the Telšiai diocese, and the remains of other 717 Soviet terror execution victims were placed in the chapel-columbarium on November 2, 2004.